Are you unsure what to do in a bunker? Do you get the sick feeling in your stomach when your ball's on the beach? Scared of skulling it across the green into the other bunker or killing someone? We all get these feelings when we start playing golf. Bunker shots for beginners are not easy but with a little practice and the technique I'm going to show you, you'll be out of there in no time. In fact, like me, you'll love showing off to your buddies from the sand pit. I'm going to cover the very basics of bunker play to make it as simple as possible. You can take these ideas onto the practice area or the golf course and hopefully stop hitting bunker shots in the teeth or taking two (or three) shots to get out so we can lower your score! As a beginner, we want to use a Sand Wedge. This can be a 56° or 58° sand wedge. Lob wedges can be used when you're more skilled but sand wedges have a large amount of bounce and a very thick sole to slap the sand with. Feet: Align feet left of the target. This can be anywhere between 2 and 10 yards, play around with it in the practice bunker - it's totally up to you and what works for you. Club face: Open the face and have the leading edge pointing either at the hole or slightly right of it, no more than a couple of yards to the right. Ball position: The ball should be played off the front foot. You can line it up with your heel or your toe, whichever gets the best result is fine. This will automatically open your club face and set your hands behind the ball. Hands: Hands should be behind the ball. I also like to grip down on the club with my hands about 2 inches from the top of the club. Imagine there is a cushion under the ball. It starts an inch behind the ball and extends a couple more past the ball. On the sides, it's an inch wide either side of the ball. Your job is to get the ball delivered to the green on that cushion of sand, like a magic carpet ride, like an engagement ring on a pillow. When you hit the ball, you enter the sand an inch behind the ball and most importantly you MUST FOLLOW THROUGH. Don't stop the club in the sand. You want to feel like the sole of the club is slapping the sand like a flat stone skips on water. And finish your shot like any other iron shot you hit. When you swing the club, swing it so your swing follows the line of your feet which is left of the target. 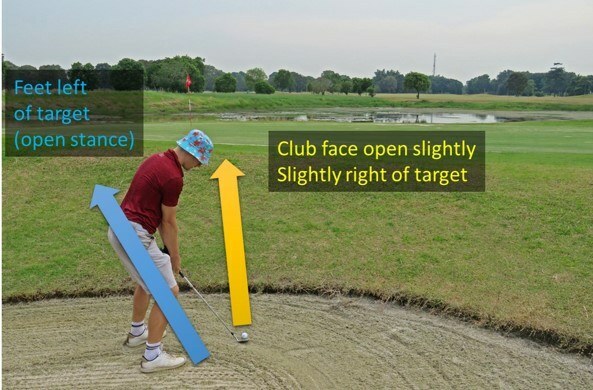 It naturally happens for most golfers when you set up for a bunker shot with an open stance, but make sure you swing as if the head is travelling back parallel to your feet line and forward along the same line. 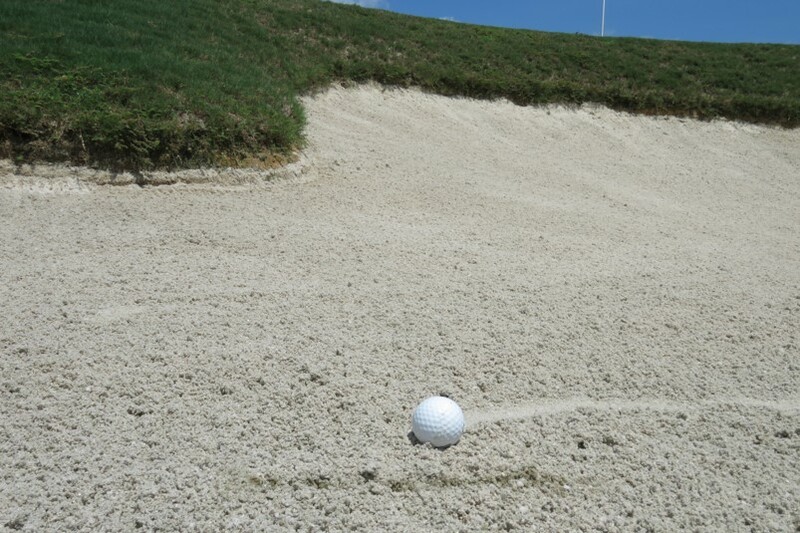 When you hit a bunker shot, you want to hear that thud of the sole slapping the sand. You know you've hit a good bunker shot when you get that sound. Notice how the club enters the sand behind the ball. Then notice in the second video that my club goes back and through along the line my feet make. And notice the follow through after the shot. There'll be difficulties learning to hit bunker shots as a beginner. But I promise, if you keep practicing these fundamentals and trust the process, you'll be a proficient bunker player. 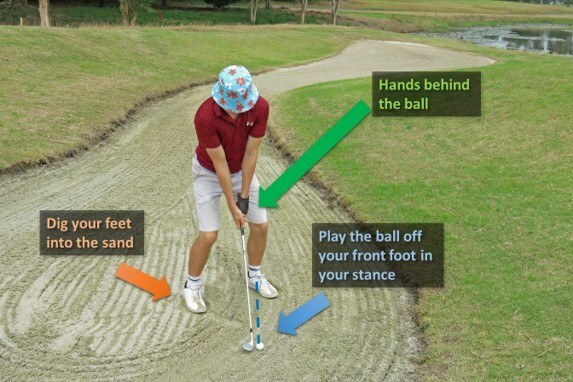 I've used these steps in my golf for years and love playing out of bunkers. You will too.